Custom Printed Bamboo Fashion Sunglasses come with Black frame, Smoke lens and also Bamboo temples. The frames of these Custom Oahu Sunglasses are made up of real bamboo wood. Chrome accent jewels on the front and temples makes them look unique and the smoke lenses make these customizable new arrival sunglasses look striking. 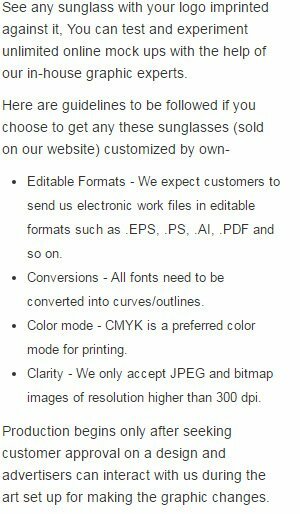 Order these sunglasses with 1-1/8" W x 1/4" H imprint area right now to gain free online proofs, free design and best price guarantee offers. Request a quote to know wholesale savings for these Custom Printed Bamboo Fashion Sunglasses. Additional Information: Chrome accent jewels on front and temples, UV400 Protection.